Thousands and thousands of guitar professionals, home instrument builders, cigar box guitar enthusiasts, musicians and others have discovered the dedication to good prices and great service that we bring to all of our sales. "After making my first-ever CBG for myself, my son and I made this one for him. Turned out great and he has barely picked up his 6-string since! It was an awesome father-son experience and I’m glad C. B. Gitty could be a part of it! We have lots of ideas for future projects, too!" “I just received a piezo rod pickup for my old Takamine acoustic/electric. Despite it being the Christmas season, it was delivered a day earlier than promised. I am very happy with the pickup. I feel like I have a brand new guitar. It sounds SOOOOO much better now. “Ben, just received my box kit and as usual all is "Perfect!" I just love being a C. B. Gitty customer and have been for the last couple of years. Just wanted to say "Thanks" for the CBG cut-outs that I will hand out at the next monthly meeting of 'Guys building guitars club' in Dallas. Can't wait to build my box CBG as soon as the "Heat" in Dallas lets up. "I love homemade instruments and love promoting the making of them. 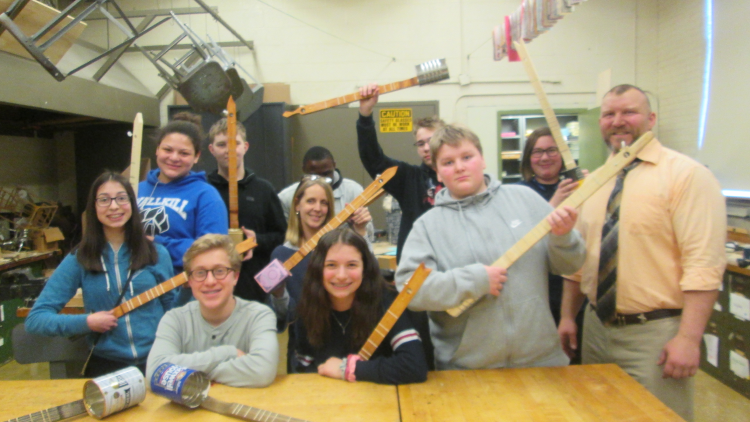 The students really had a good time (building the canjos we got from C. B. Gitty) and I wish there was a way to do this project with all of my students but at the moment that just isn't feasible. I make tons of instruments and have had several posted on your site and I have no plans to stop making them! I give them to family members and friends as presents and even sell a few here and there. Thanks again and please let everyone there know how much they are appreciated." “Hello friends at C. B. Gitty. I just wanted to let you know that the plain, simple slide CBG I recently ordered is just great. Easily assembled, as advertised. “Thank you so much! My husband is fascinated with your site too! Your CBG kit helped me overcome the inertia and start building. I sincerely love your website; you don't just sell products, you provide inspiration and support through newsletters, blogs, and other free features. “There is no denying that these beautiful parts form the basis of the dream. How do you know what your CBG is going to look like unless you look at and choose the parts you want? “Got my guitar kit today, spent a leisurely half hour putting it together this evening and am completely pleased with the results. Surprised at the volume, even more so at the sensitivity - this will make me a much better slide player in short order. “Mr. Ben Gitty---thank you, thank you, thank you! I received my first (and not the my last) order from C. B. Gitty!!! I gotta tell you, Ben and his peeps rock! The shipping was über fast and super affordable. I got an email notice once my stuff was pulled from the shelf and shipped which was less than 12hrs. It was packed well and everything looks pretty tip top, although I haven't had a chance to test the electric harness, but I'm sure it's good too. You all can buy from these folks with extreme confidence. BTW My XXXXL t-shirt is the best walking-talking billboard ever. “Just wanted to say thank you for the manner in which you conduct your business. You are always prompt with your deliveries, accurate in what you send, have reasonable prices, and I LOVE the personal notes you include with the shipment! I hope you NEVER quit doing what you are doing and the way you are doing it! Great job! So far I've made 14 guitars and have given 7 away. I love making them, even though I'm not much of a carpenter. It's just fun! Your business has helped me a lot in finding and obtaining the supplies I need. Plus, I get new ideas from you. I can hardly wait to try the electric percussion box you showed in your newsletter! "Good, honest, up-front company. Love their products and their service." “I began making cigar box guitars after getting released from hospital for cancer treatment. I could not return to work, and needed to occupy my time, so I decided to give making these type of guitars a try. I love the fact that I can put my own spin on each of them, making them truly unique. Music is universal and can heal the soul and calm the mind. I like knowing I am doing something that will outlive me, and possibly enrich someone’s life. I have some of the highest standards when making my cigar box guitars, I want them to not only sound great, but to actually look and feel great too. So, when I am crafting one, I really think about what makes sense. From the neck to the sound holes and everything in between is carefully thought out and tested before set in stone. My plan is to continue to make these instruments and possible sell them online, once I get at least 15-20 made. “I first became interested in cigar box guitars when I came across some on YouTube videos. So I started doing a lot of research and found out from a man named Shane Speal that I could buy all the parts I needed from the C. B. GItty Company. I started gathering up my parts and found a place near where I live that I could buy cigar boxes for one dollar apiece. And then of course I put in my order to C. B. Gitty for the parts I could not find locally and received my order in two days which I could not believe how fast it arrived. I put quite a bit of thought into my design and procrastinated a little bit but then I realized that these guitars are supposed to be simple and so I just dove into it and ended up putting it together in a little over one week. I had to work out some bugs on it because this is a resonator guitar and I used a paint can lid that I bought from C. B. Gitty. I was getting a little bit of buzz when I strummed the strings and I discovered that it was the bolt and nut I was using for a bridge and so I swapped that out for a piece of red Oak and the buzz went away. I am very happy with my guitar build and it would not have been possible without Shane Speal and the C. B. Gitty Company. I am already making plans to build more guitars and I will be buying all of my parts from C. B. Gitty. "C. B. Gitty Crafter Supply's customer service was top notch, and the shipping was fast. The fret wire and [fretting guide] CD arrived quickly and in perfect condition." "C. B. Gitty is more than a business with sales and customers. It is a community where both sides collaborate in advancing production and appreciation of instruments and the music created with them. This includes but is not limited to materials instruments and lessons. I've found it the most beneficial site around for finding a deeper connection to my music." "I am a retired engineer and enthusiastic maker of 'things'. Generally, model toys, games, puzzles and novelties. 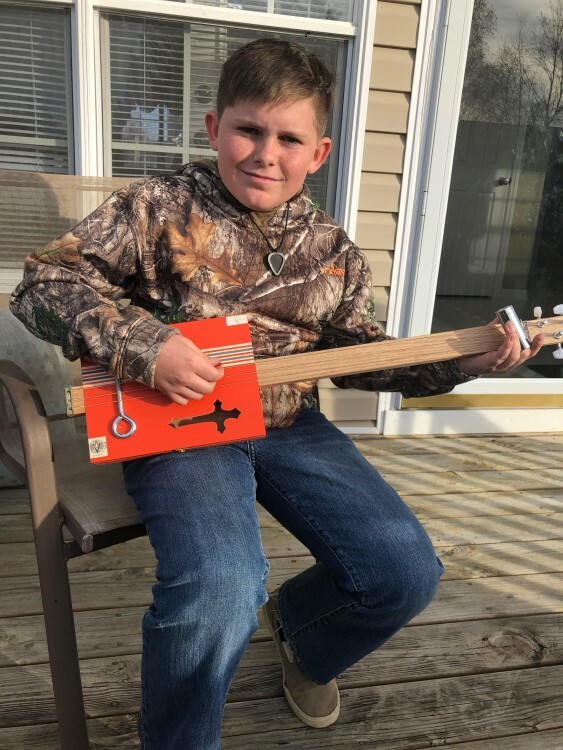 Music is a mystery to me, but I was captivated by the simplicity of the Cigar Box Guitar concept and thought I would have a go at making one as a surprise for one of my grandsons who plays guitars. The C. B. Gitty and Cigar Box Nation web sites are so helpful. Shared discussion on one of the Forums, parts purchased from C. B. Gitty Crafter Supply and the Glenn Watt videos all spurred me along. I have thoroughly enjoyed the project, learned things along the way and am pleased with the result. It makes a nice 'twang'. I am sure my grandson in New Zealand, to whom I shall present it at Christmas, will serenade me with a tune or two. I shall direct him to the C. B. Gitty website for more information." "I love the fun attitude and spirit that C. B. Gitty has about being creative in using anything that works to create an instrument." "Gitty has been my major supplier and has enabled my business to grow every year for the last 6 years. The service has always been great and I don't think I could do it without them." "Builds go so easy with C. B. Gitty's large selections good pricing and fast shipping." “This will sound like an advertisement, but what the hey... I don't think I could have done this project without C. B. Gitty! The fret saw in particular was a God-send. Accurate, easy to use, and inexpensive. Same for the fret finisher. I also purchased the fret template which took the guesswork out of laying out the frets. As a result, the intonation is great.Perhaps the best resource was the book I purchased, Mike Orr's "Handmade Music Factory". While not perfect, it gave me just enough to start creating my own instrument and feel comfortable about the process. "What a joy to be able to put an instrument together and play it. I have played for forty years and just heard of these beauties. I purchased the fretting kit and some snazzy embellishments to start on my journey. I have made a diddley-bow and two 3-stringers, and am learning and getting better every day. This is a perfect hobby for a blues-loving, retired English teacher. The open G tuning has taught me more about the fretboard and (dare I say) theory than I ever knew before. Thank you for providing everything I could ever need to make a new guitar. Also, your videos on YouTube have been rather handy several times. You have a fan for life in Ohio."